Riot police clash with Zimbabwe Congress of Trade Unions activists in Harare. Harare magistrate Lazini Ncube dismissed with costs Thursday an urgent chamber application by the Zimbabwe Congress of Trade Unions (ZCTU) challenging a police ban on demonstrations against government's 2 percent tax on electronic transfers, coupled with rising poverty levels in the country. In his ruling, Ncube cited, among other reasons, Wednesday's shooting of a Harare man which ignited riotous scenes in the city centre. "Applicant gave notice of their intention to march on several economic issues including 2 percent tax imposed on electronic transfers by Minister Mthuli Ncube and inflation. The applicant also pointed out that the demonstration should go ahead because it is a constitutional right for the public to demonstrate. "... The application is dismissed with costs," Ncube said. The ZCTU demonstrations had been planned for the whole country but police issued an order earlier during the week, banning the civil action while citing the current cholera outbreak that has killed 49 people. Truckloads of police officers Thursday morning besieged the labour group's offices countrywide and dispersed groups of activists who had congregated at the centres to proceed with the protests as they insisted they were not going to be stopped from expressing their constitutionally guaranteed rights. ZCTU president Peter Mutasa, secretary general Japhet Moyo and dozens were arrested in Harare, Mutare and Masvingo. A court bid seeking the overturn of the ban fell through after the courts upheld the police embargo. In its submissions, the state, represented by lawyer Rufaro Mutandwa who was from the Attorney General's office, said the country's political situation was still too hostile for the anti-government protests to proceed without incident. She cited the killing of a Harare man following skirmishes over parking space a day before. "Tempers among civilians in Harare's CBD are still high and demonstrations could pose danger to many citizens in the capital and elsewhere if the protests turn nasty," she submitted. Zimbabwe Lawyers for Human Rights' Noble Chinhanu, who represented ZCTU, had argued that citizens had the right under Zimbabwean laws to express themselves through demonstrations. 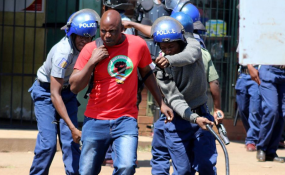 He also cited Wednesday's graduation ceremony that was presided over by President Emmerson Mnangagwa at the University of Zimbabwe as one case of a gathering that was allowed by police to go ahead. Chinhamu also said cholera cases were subsiding. Meanwhile, there were not developments yet on the fate of the ZCTU leaders arrested as their lawyer said late Thursday noon his clients were still in police custody and no charges had been laid against them.